Rom is in Project Safeguard, the installation that was set up to monitor alien activity. Completely run and filled with Dire Wraiths, Rom probably picked the wrong building to invade, but invade he must. It was obvious from the start that Rom would be captured as he is on the Wraith’s home turf and he is laid out on the Magneto Disc so that they might experiment on him. But Sister Sweet, who wants to explore the being that is the Spaceknight, is thwarted by the High One who just wants him, and Firefall/Archie Stryker, dead. But Rom and Stryker will not go down that easy as Firefall creates a diversion and Rom manages to break free. 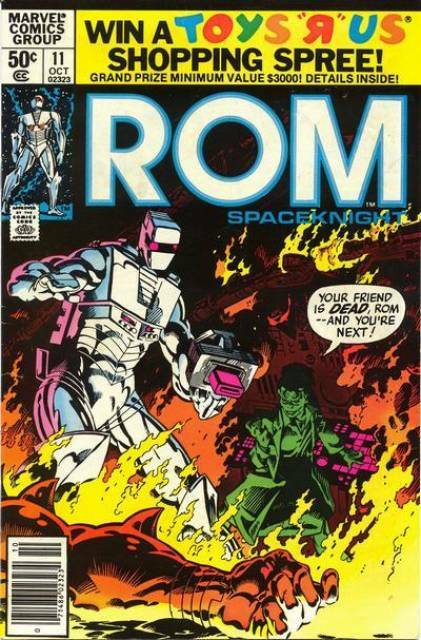 Rom takes the fight to the Wraiths and Stryker makes the ultimate sacrifice so that Rom might regain his Neutralizer. Bill Mantlo and Sal Buscema deliver another exciting story with this particular issue, filled with action and drama of the highest calibre. The Wraith hierarchy is explored a little bit with this book, and we finally see the demise of Sister Sweet. The High One has barely made any appearances, but seems like he will be a formidable foe for Rom should they ever meet. The book is left with Rom having to make a hard choice as well as leaving it on a cliff-hanger. Buscema keeps outdoing himself with every book as Rom strikes an imposing figure whether amongst the humans or against the aliens. This book is a science-fiction drama that has been combined with the Marvel style of super-heroics and has consistently been a must-read book. Next issue looks to be like it will be much of the same and that is a good thing.